Today we are showing you the first excerpts of the film the Israel lobby does not want you to see. The news channel Al Jazeera sent undercover journalists into pro-Israeli government groups in the United States. 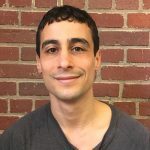 Among several things, they uncovered closely-coordinated efforts by these groups and the Israeli government to monitor, smear, and intimidate U.S.-based defenders of Palestinian rights. The film is called The Lobby USA, but it has never been released. That’s because the Israeli government and the Israel lobby pressured Qatar to censor it. Qatar, which owns Al Jazeera, caved to that campaign, citing national security. But that censorship has not buried the film for good. The website Electronic Intifada has obtained the first excerpts of the film. But before we go to that excerpt we’re going to speak first to the journalist who obtained it. Asa Winstanley is the independent journalist and the Electronic Intifada’s associate editor. Welcome, Asa. First of all, congratulations on this scoop. This is the second major scoop that Electronic Intifada has had about the censored film. You first revealed its contents. Now you’re actually showing us an excerpt. So set up the scene for us with this excerpt that you’ve obtained. It concerns a wealthy pro-Israel donor named Adam Milstein and his funding of the group the Canary Mission. Explain who he is and the group that he funds. ASA WINSTANLEY: Well, Adam Milstein, as you said, he’s an Israeli American financier who, you know, he’s said to be worth some half a billion dollars, and he funds various pro-Israel groups in the U.S., including the Israel On Campus Coalition, Stand With Us, AIPAC, and many others. 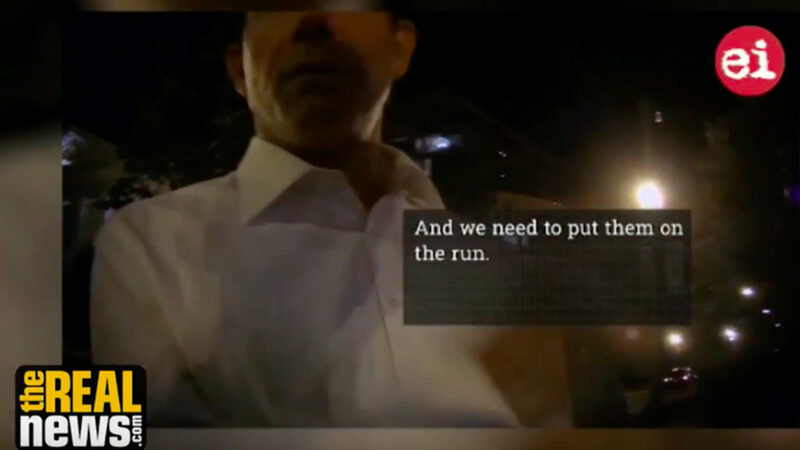 And in this clip, Eric Gallagher, who was at that time the development director for another group the Milstein funds called the Israel Project, is speaking to Al Jazeera’s undercover reporter, who was interning at that time with the project. And he sort of, he’s basically trying to get in good with him, and he’s telling the reporter that- well, you’ll see in the clip. AARON MATE: OK. So let’s go to the clip. So we have first, in this excerpt, we have Tony, as Asa was just describing. Tony is the undercover Al Jazeera journalist. He’s speaking to Eric Gallagher. And Eric Gallagher’s explaining to him who the funder is of the Canary Mission. And then later on we go and we see that funder, Adam Milstein, talking about his work and why he is funding websites like Canary Mission. This is the excerpt. ERIC GALLAGHER: In this country you have these billionaire types who are starting to realize, they go, wow, I don’t need to participate in the Democratic Party. I could build my own apparatus and have influence in Los Angeles, or Detroit. And [Adam Mil] seems one of those guys. VIDEO NARRATOR: Milstein old Tony how critics of Israel should be handled. ADAM MILSTEIN: First of all, investigate who they are. What’s their agenda? They’re picking on the Jews because it’s easy, because it’s popular. We need to expose what they really are. And we need to expose the fact that they’re anti- everything we believe in. They’re anti-freedom, they’re anti-Christian, they’re anti-democracy. That’s what we need to do. AARON MATE: So that is a clip from the censored Al Jazeera documentary called The Lobby USA. And we just heard there an undercover journalist speaking to Adam Milstein, the funder of Canary Mission; before that to Eric Gallagher, who was working for a pro-Israel lobby group and revealed Milstein to be the funder of the Canary Mission. So explain what the Canary Mission is, and the significance of this revelation that Milstein is its funder. ASA WINSTANLEY: Yeah. The Canary Mission is an anonymous website that’s been going since 2015. And it has on it profiles of Palestine solidarity activists. Mostly young students, often of Palestinian heritage, and all Muslim background. And it smears them as anti-Semites, as racist. And it has the explicit goal of denying them future career prospects. On each profile it has at the top, if you a racist, the world should know. And some of the authors behind the website state as their goal to keep this secret who is running this website. Their main goal is to keep the the people behind it a secret. And in that clip, Eric Gallagher stated that it’s Adam Milstein who actually originated it. AARON MATE: And they have kept that secret up until this point. So let’s go to another clip, not from the documentary, but from the Canary Mision itself where it talks about its mission, what it does in the U.S.
CANARY MISSION VIDEO: College campuses are filled with anti-Semitic anti-American radicals, waving Palestinian flags and placards, and screaming apartheid, and murderers. A few years later, these individuals are applying for jobs within your company. There’s no record of their membership of radical organizations. No one remembers their yelling profanities on campus, or attending Jew-hating conferences and anti-American rallies. All evidence has been eradicated, and soon they will be part of your team. We are Canary Mission, an organization dedicated to documenting these acts of hate, exposing them, and holding these individuals accountable. Join us to combat this wave of hatred, protect freedom, and make campus life safe for everyone. It is your duty to ensure that today’s radicals are not tomorrow’s employees. AARON MATE: A clip from a publicity video from the Canary mission. So in terms of the impact of this group, this has meant, right, that job applicants have been questioned about their Palestinian solidarity work. And from what I understand of what the film contains, and also just from what from what the Electronic Intifada has been reporting, it’s also meant that when students, or anyone, really, especially those of Palestinian origin living in the U.S., come to Israel, that that information supplied by the Canary Mission has been used in some interrogations. Is that true? ASA WINSTANLEY: Yeah, that’s correct. We’ve reported for years now that Palestinian American students who go to visit family and friends in Palestine, in the occupied West Bank and elsewhere in Palestine, that they are denied entry after having been profiled on Canary Mission, despite not necessarily being, you know, somebody like myself, like a journalist, who, you know, has a public profile. They may just be students with some, you know, they’ve joined the local Students for Justice in Palestine, for example. And they’ve been profiled on Canary Mission, and then soon after report being denied entry. And even more recently, this month the Forward reported that Andrew Kadi, who is a Palestinian American who works for the, who works for the U.S. campaign against the occupation of Palestine solidarity organization in the U.S., that he actually saw the people, the Israeli border officials use, actually use the Canary Mission profile as the basis for them questioning him upon entry. AARON MATE: OK. So aside from free speech and privacy rights, this raises another issue, which is the extent of the coordination between the Israeli government and these lobby groups in the U.S. and whether or not that raises issues of violations of laws around foreign agent registration, because these groups are not registered as foreign agents. What can you tell us, based on the film’s revelations, about the extent of cooperation between these U.S.-based lobby groups and the Israeli government? ASA WINSTANLEY: Yeah, it’s a good question. These groups work very closely with the Israeli government. And what we’ve written in this article, it’s not in one of the clips that we’ve released, but we know from our sources that Jacob Baim and Ian Hersh of The Israel on Campus Coalition, who seem to be the people who actually run the Canary Mission on behalf of- not Sheldon Adelson- on behalf of Adam Milstein, the founder of the Canary Mission website, according to Eric Gallagher. And they, in the film and in excerpts that haven’t been released yet, they state that they are working in, they communicate with and they coordinate with, the Israeli Ministry of Strategic Affairs. Which is essentially, I mean, in my analysis, in my reporting I’ve called it essentially a covert sabotage campaign. Covert sabotage operations. It’s almost like a new Israeli intelligence agency. Its focus is on working against the Boycott Divestment Sanctions movement, BDS, and other forms of solidarity with Palestine around the world. And it does that in coordination with groups in many different countries. And in this sense, the Al Jazeera film, Jacob Baime’s deputy at ICC, Ian Hersh, says that they work closely with the Ministry of Strategic Affairs, and they actually coordinate with the Ministry of Strategic Affairs. So as you say, it does raise questions of perhaps these groups should really be- are they in violation of U.S. law by not registering as foreign agents. AARON MATE: The question raised by the film. Finally, Asa, I want to make a point, which is that there has been some debate for a while about the extent of the influence of the Israel lobby. You know, and people have strong opinions on this issue. My personal opinion is that it’s in some respects overblown when people say that the Israel lobby shapes White House policies, it shapes, you know, national U.S. policies. I’ve always felt as if that goes too far. Because, for example, when the Israel Lobby and the White House clash, like on the Iran nuclear deal, the Israel lobby is usually brushed aside. But on matters such as this, when it points to pressuring people, trying to intimidate activists, intimidate voices, brave defenders of Palestinian rights, and wielding a large amount of money toward that end, I think that this film and the revelations that you’ve been uncovering at the Electronic Intifada provide a stark illustration. And, of course, in terms of impacting congressional races, because the Israel lobby can raise a lot of money there. But I just think that the fact that this film has exposed the secret maneuverings to combat activism speaks to where the Israel lobby is most influential and insiduous in the U.S.
Let me ask you, finally, you have broken a lot of news so far on this film, its contents and the first excerpt. Are there more excerpts coming? ASA WINSTANLEY: Well, we’ve stated what we’ve stated in the article, and that’s all we’re going to be saying that for now. And I think that the question that- I mean, what we’ve always been calling for in terms of if there’s anything we’re calling for is that Al Jazeera should release the film. We want Al Jazeera to broadcast the film. Because you know, the film, what we know of it so far, is an important piece of work. And we know that when they did The Lobby, the UK edition last year, there were complaints put in about it with the UK’s broadcasting regulator by some of the subjects of the film, accusing it of anti-Semitism, and accusing it of being unfair and selectively edited, and all those kinds of things. The broadcasting regulator looked into it. They looked, you know, they put the film through the ringer. They looked at unedited footage to verify it, and all these kinds of things. It was vindicated on all counts. So really, these kind of pressure behind the scenes, legal, you know, sort of implications that there might be some sort of legal threats and whatnot, are delaying tactics to try to stop the truth getting out. So the question needs to be asked to Al-Jazeera, why are you not broadcasting this film? And I think we should see it broadcast today. AARON MATE: You know, it’s interesting what you say there about the vetting process in the UK, because as I understand it the film also went through a vetting process here in the U.S., where people like Adam Milstein were given an opportunity to reply to the film’s revelations. But as I understand it, Milstein and others declined that opportunity, right? ASA WINSTANLEY: Yeah. That’s right. Clayton Swisher said months ago, he wrote an article for the Forward about his frustration that the film had been put on ice. AARON MATE: And Clayton Swisher is with Al Jazeera, to explain who he is. ASA WINSTANLEY: That’s right, sorry. Yes, Clayton Swisher, the head of the investigations unit of Al Jazeera who, you know, whose project- the unit that ran this project. He’s talking about his frustrations that it’s been put on ice. And he’s saying that we gave them, we, months ago we sent letters out, about 70 letters out to all the subjects of the film. Hardly any of them replied. A very small handful of people replied, and Milstein did not reply to these multiple requests for comment. So you know, he doesn’t have the excuse of, like, I didn’t see the email. He’s effectively chosen not to apply until yesterday, when we published our article and we released these excerpts of the film. So the fact that he’s been outed, now only now he’s denying it. And that tells you a lot. AARON MATE: Well, Asa, in the absence of Al Jazeera releasing the full film, which appears unlikely, given they have already caved to the very heavy pressure they faced, we will hope for more excerpts from the Electronic Intifada. If you want to see the first excerpt that they have released, you can go to ElectronicIntifada.net. Asa Winstanley, associate editor at the Electronic Intifada, thank you.